Friday September 13th 1878 As soon as the breakfast dishes were washed I went to town with Rob in the buggy. We got a new stove for the sitting room and did a lot of other trading. Got home by ten oclock and I helped Mother get dinner while Hatt helped Rob put up stoves. In the afternoon I went out to Fletchers to see Adda and did not come home till just evening. Hatt was gone to town all the evening. I went to bed early. I was nearly down sick with a cold. 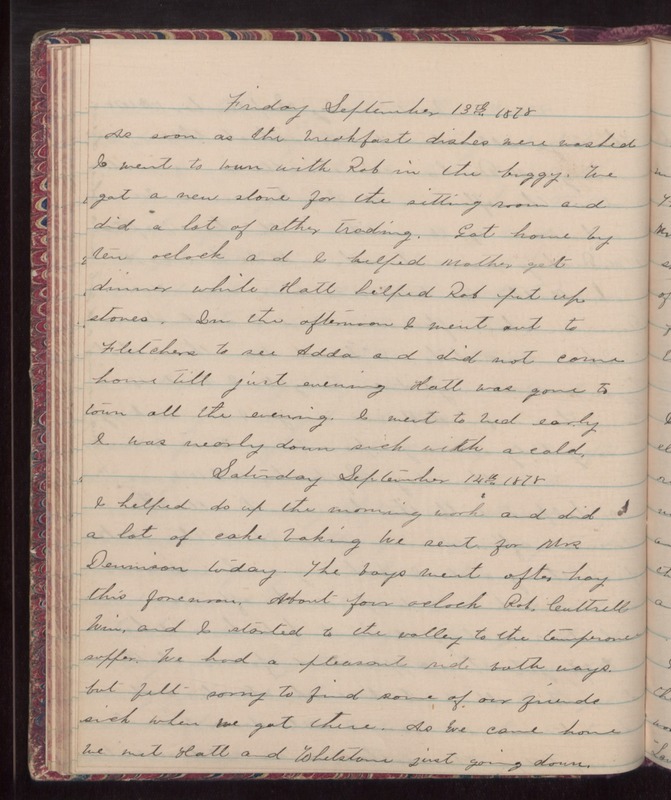 Saturday September 14th 1878 I helped do up the morning work and did a lot of cake baking. We sent for Mrs Dennison today. The boys went after hay this forenoon. About four oclock Rob Cattrell, Win and I started to the valley to the temperance supper. We had a pleasant ride both ways. but felt sorry to find some of our friends sick when we got there. As we came home we met Hatt and Whetstone just going down.